I kinda love candy corn. These are actually a kit from Martha, but you can read her instructions on how to make regular pom poms HERE. Too funny. I bet there is a way to even make them the right shape! 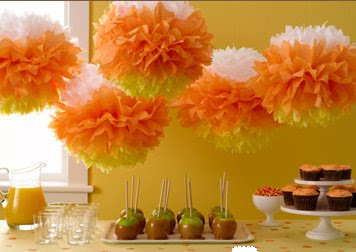 if I remember correctly, you love the idea of candy corn, but don't like to eat them...I LOVE everything about them but could never decorate with the real thing because my decoration would be GONE!